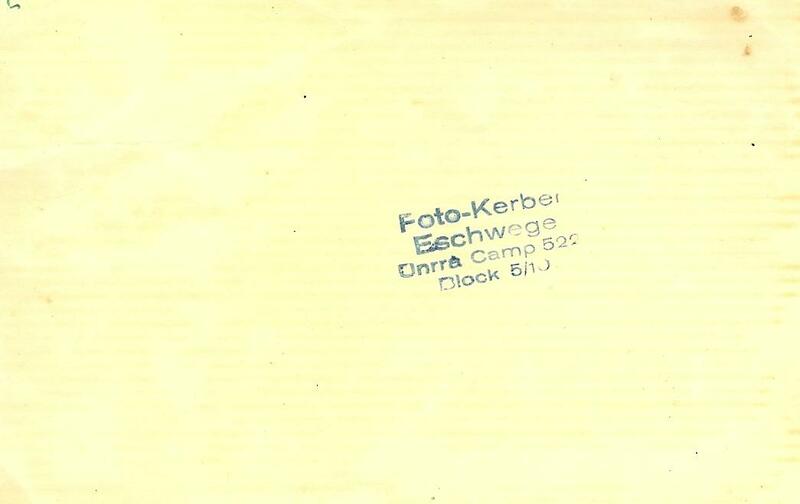 To the memory of Abraham ("Umcza") Kerber Gombin, Poland 1907 - Kiryat Tivon, Israel 1978, son of Herszz & Mirla Kerber, Holocaust survivor, a photographer in the DP camp Eschwege. Blessed be his memory. 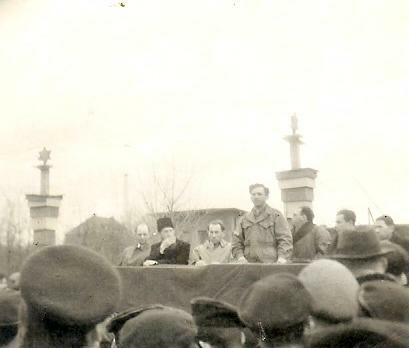 From Zeew Klasner album: DP camp Eschwege, Kibbutz L'Shihrur in a roll-call before demonstrarion against the British, to open the gates of Eretz Israel to free immigration of the Jews, photograph: Kerber. 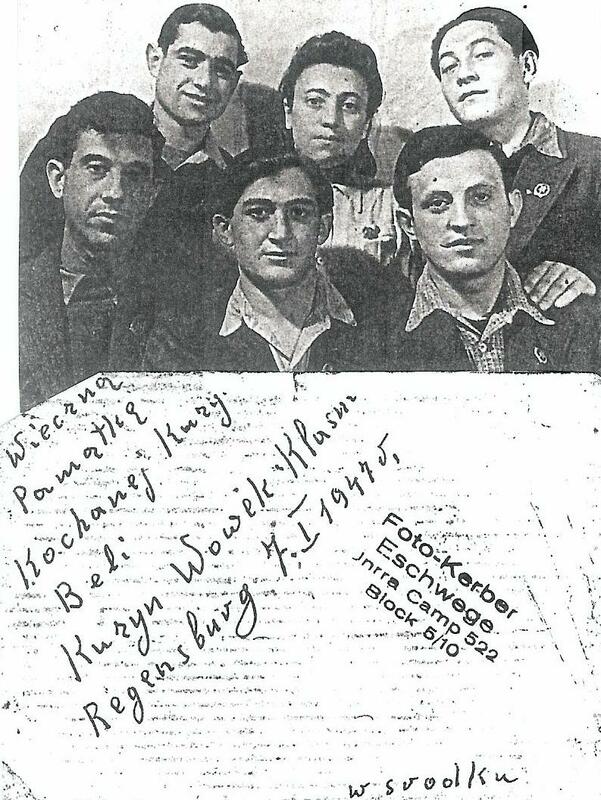 From right to left: Benjamin Gurewicz, Icchak Pirkus, Mendel, Chaim Birenbaum, Zarywacz (brother of Marysia), Yona Blank, Arie Rozenfeld from Turobin, Sara, Miszka, Abraham Cygielman, Abraham Kac (killed years later in military service at the IDF), Fajga Kiferbaum, Zlata Rozen, Chana Gonszewska, not identified, Bronia, Zeew Klasner, behind him Chajka Migdalowicz, Batia Zarywacz and her sister. to my dear friend Miszka, for memory, Haim Eschwege 26/7/1947. זאב הגיע מקיבוץ של השומר הצעיר שהתארגן בלובלין. הלינה הגיעה מוארשה, גדוד "שחרור". הצלם אברהם "אומצה" קרבר היה פליט ניצול שואה כמו כולנו, אך הוא לא חי בקיבוץ אלא במחנה עצמו שהיה כמו עיירה בזעיר אנפין. הוא אהב מאד לצלם את הנוער החלוצי בכל מיני אירועים, מחיי היום-יום של הקיבוץ, ממסיבות, תהלוכות, הפגנות וטקסים שונים ועשה זאת בהזדמנויות רבות. היה מסתובב בשטח המחנה עם מצלמת לייקה Leika כרוכה על כתפו ולא מפסיק לצלם עוד ועוד. היה גמד ומראו החיצוני עורר חמלה ואהדה בקרב הניצולים. "התייחסנו אליו בהבנה וסלחנות. השתדלנו לא להעליבו. בר"כ ראינו אותו בליווי קרוב או מכר שלו שהיה צמוד לו כל הזמן. לא ידעו כיצד עבר את השואה וכיצד שרד", מספר זאב. כולם היו שם פליטים חסרי-בית שאיבדו לרוב הכל, את ביתם ומשפחתם. שרידי הפליטה, אחד מעיר ושניים ממשפחה. היו ששערם הלבין בלילה אחד. התאספו והתקבצו יחדיו מהיערות, ממחנות הריכוז והמוות, פליטים מרחבי ברית המועצות, מהמנזרים וממקומות המסתור. אירועי המלחמה השאירו בכולם חותם כאילו התבגרו במאות שנים. אף על פי כן, התארגנו חיי תרבות וחברה, במיוחד בעידוד שליחי הסוכנות ותנועות הפוליטיות של ארץ-ישראל. אומצ'ה קרבר תיעד כל זאת ללא-הפסק. מחנה הפליטים אשווגה היה על שטח ששימש כשדה תעופה במלחמה. היו שם מאות מטוסים צבאיים הרוסים, עדות אילמת לתבוסת הצבא הגרמני. אנחנו היינו בחווה חקלאית בשטח השדה. מדריכים חקלאים גרמנים הדריכו אותנו. ועיבדנו את האדמה כחלק מתוכנית הכשרה לקראת הגשמה וחיים חלוציים בקיבוץ, אחרי כן בארץ-ישראל. הלינה בירנבאום תיארה את חיי הקיבוץ של הצעירים הרווקים – כ-100 בני נוער. בערך, בספרה "חזרה לארץ אבות" שיצא לאור בפולין בשנת 1991. התארגן גם קיבוץ של מבוגרים יותר, בעלי משפחות, וזאת בחלק אחר של המחנה. הוא נקרא "לדרך". 4 גרעינים שונים מרחבי פולין: "מרדכי אנילביץ'", "טושיה אלטמן", "חביבה רייך", "לשחרור" אוחדו לקיבוץ אחד בשם "לוחמי הגיטאות". 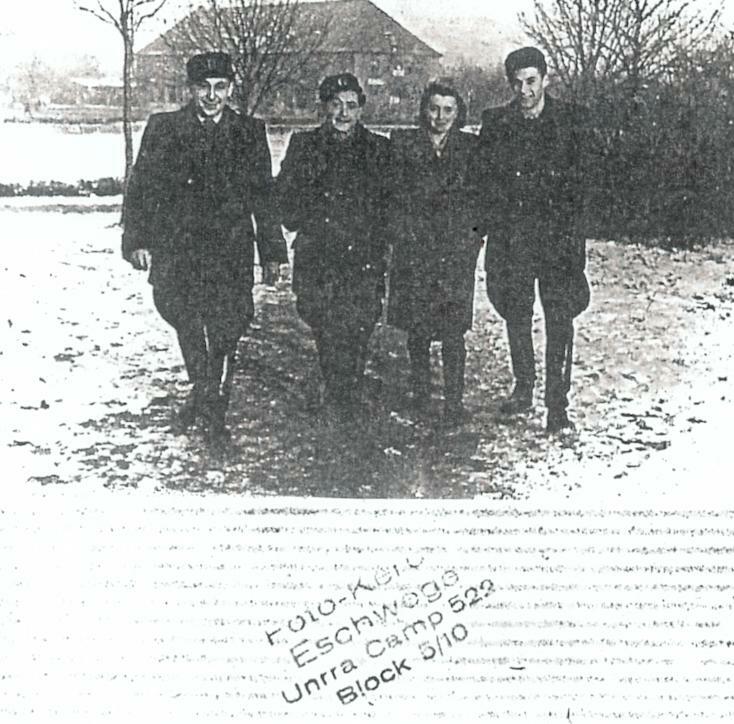 The group near a German destroyed aircraft, eschwege DP camp (contributed by Zeew Klasner). On top Zeew Klasner, Abraham Cygielman, Szlomo Blank, standing from right to left: Jankiel Skura, Sara Preser, Yona Brochanski. מחנה העקורים אשווגה היה שייך לאזור האמריקאי, עם תמיכה מסיבית של אונרא1). היה זה בצפון גרמניה, קרוב לברלין. העיר קאסל Kassel הייתה עיר המחוז. ביקרו במקום ממנהיגי תנועות הפועלים הציוניות, בן-גוריון בראשם ואחרים. היו כל העת פעילים מדריכים, שליחי הסוכנות היהודית וביניהם זכור לטוב שיקה ברוק מקיבוץ נגבה. בסתיו 1947 עזבה קבוצתם את אשווגה ואת אירופה ויצאה למסע העפלה לקראת חיים חדשים בארץ ישראל. This site is dedicated to his memory. Zeew arrived from a Kibbutz of "Hashomer HaTzair" which was organized in Lublin. 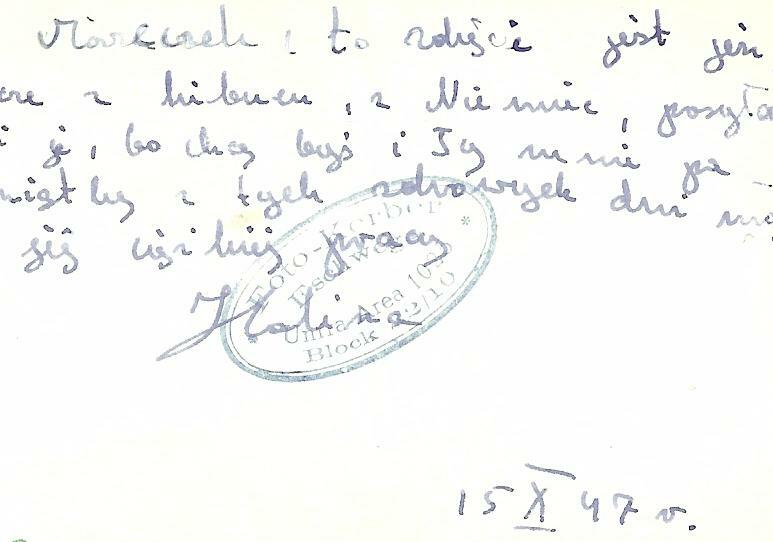 Halina arrived from Warsaw, Kibbutz "L'Shichrur" (to freedom). 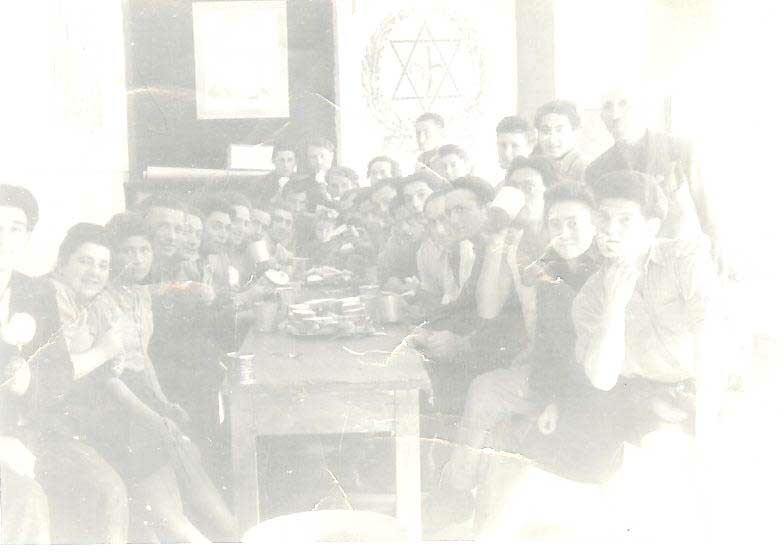 We were in one organized Kibbutz Hachshara (a preparatory Kibbutz) at the DP camp of Eschwege. The photographer Avraham "Umcza" Kerber was a refugee, a Holocaust survivor like almost all of us. 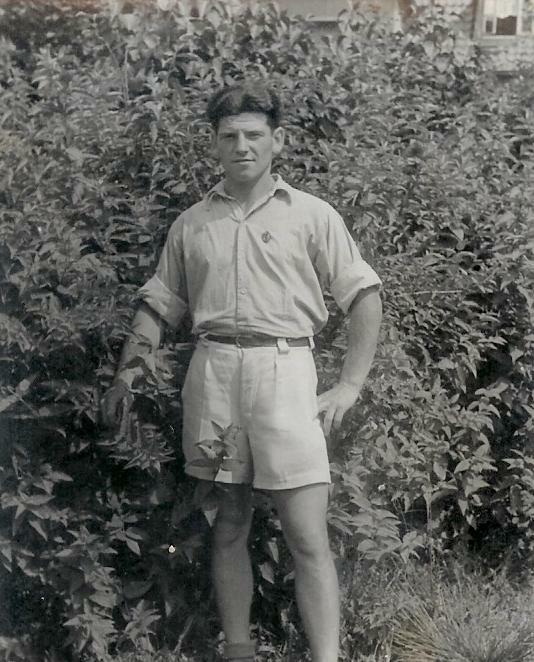 But he didn't live with us in the Kibbutz but in the camp itself, which was quite like a small town by itself. He loved very much to photograph the Zionist pioneer youth, on many occasions and events, the daily life of the Kibbutz members, their agricultural work, their parades and demonstrations, their dances, their meetings. He used to walk around the camp with a Leika camera on his shoulders and didn't stop photographing. He was a dwarf and as such, roused much pity and compassion. "We saw him always walking with a relative or a friend, maybe from his hometown Gąbin (Gombin). We didn't know how he survived the Holocaust", says Zeew. Everyone there were Holocaust homeless refugees who lost everything, their family, their community, their property… Some survived the war hidden in the convents and villages on the Aryan side, or in the Soviet Union, or were survivors of the German concentration camps. The war events left their mark on the soul of each one, as if they had aged hundreds of years. There were youngsters whose hair became white in one day. In spite of the bitter past, cultural and social life was organized, mainly with the encouragement of the Sochnut (the Jewish Agency) and political movements in Eretz Israel. Umcza Kerber documented it all. 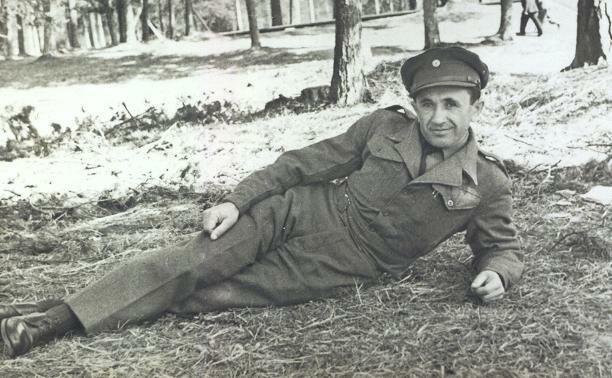 In the photograph, among others: Chaim Birenbaum, Szerman, father of Sima who was the "waggoner" and took the people in his cart around the camp. 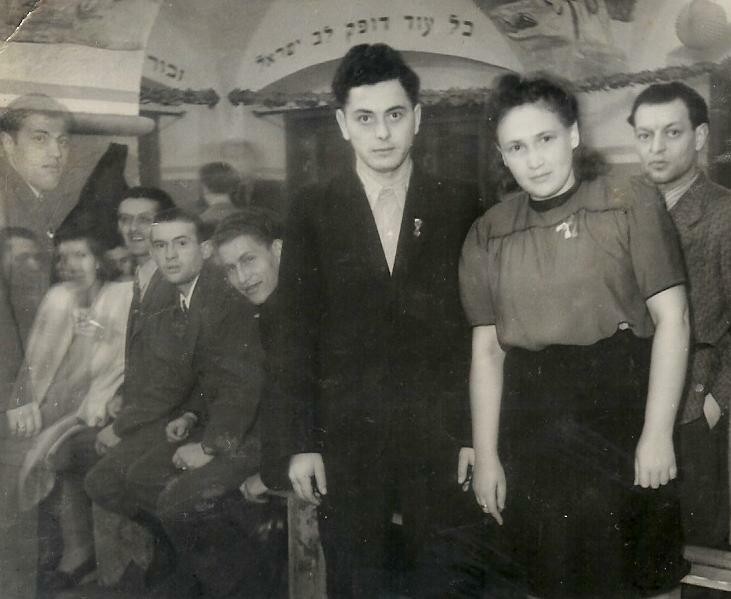 Sitting to the left among others: Szmuel Kriger, Chana Gonszewska and Halina Balin (Birenbaum). 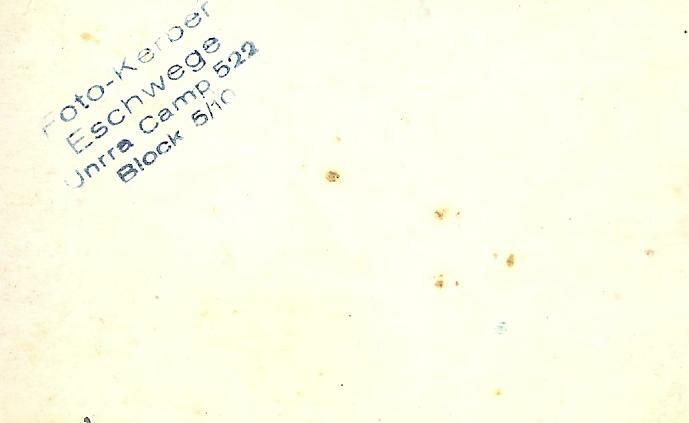 The DP (Displaced Persons) camp Eschwege was located on an area of a military airport. There were hundreds of grounded and destroyed German airplanes, a silent testimony to the German defeat in World War II. We were on an agricultural land in the airport. Agricultural German guides instructed us and we cultivated the earth as part of a program to prepare us for future life in a Kibbutz in Eretz Israel. Halina Birenbaum described this life in details in her book (in Polish) "Back to the Land of Our Fathers", which was published in Poland in 1991. 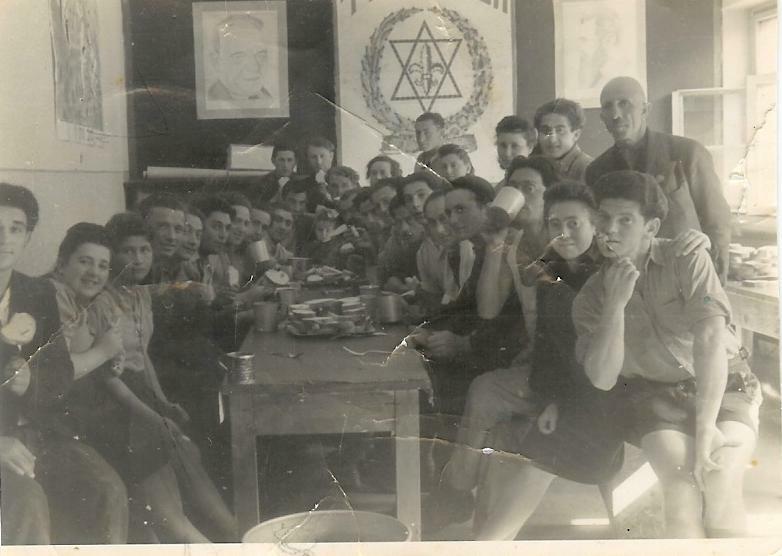 Another Kibbutz was organized for older people already with families, and they were living in another part of the camp. That Kibbutz was named: "Laderech" (to the road). 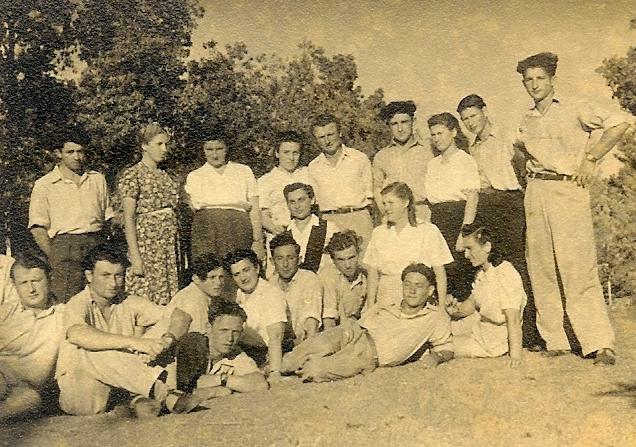 Our Kibbutz was formed from four smaller Kibbutzim which were spread out in Poland after the war: "Mordechai Anielewicz", "Tusia Altman", "Hawiwa Rajch", and "L'Shichrur" (to freedom). 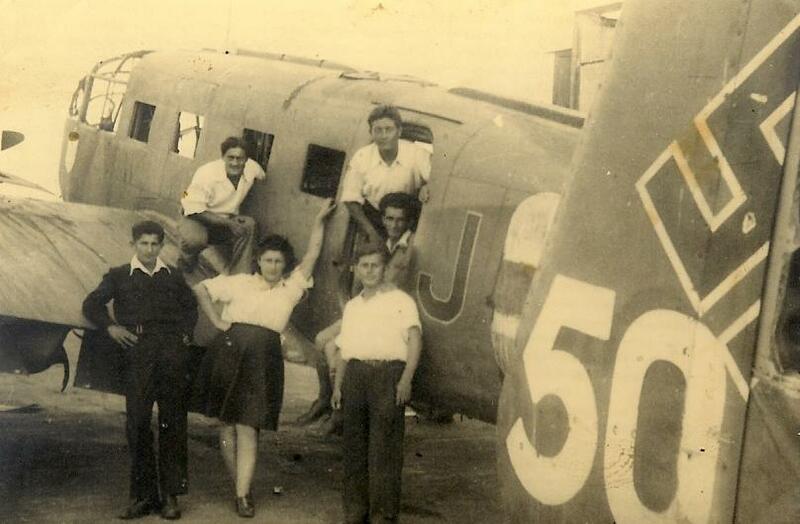 The combined Kibbutz was named: "Lochamei Hagetaot" (Fighters of the Ghettos). 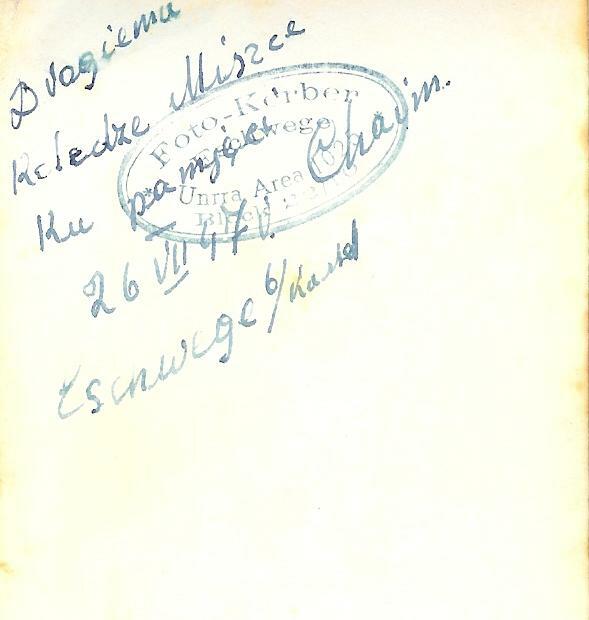 It described the daily life of the youngsters in the DP camps, their hopes and dreams, their education and political orientation and pioneer idealist life, of those who lost everything but the great dream for "aliyah" (immigration to "Eretz Israel") which gave their life new meaning and restored their broken youth. 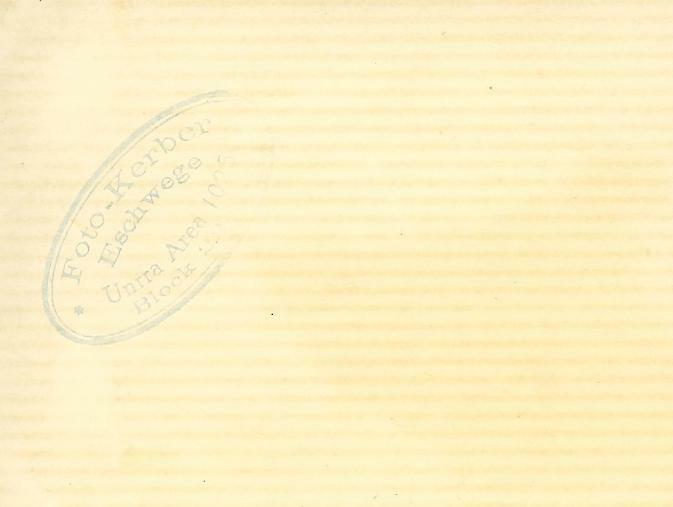 The DP camp Eschwege belonged to the American Zone, and existed with the massive support of UNRRA. It was located in the north of Germany, not far from Berlin, near the district town of Kassel. 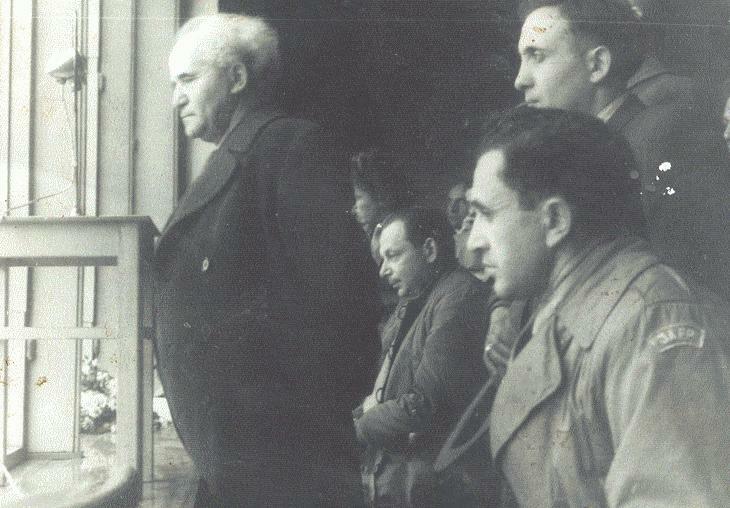 Various leaders of the Zionist movements visited the place, among them Ben-Gurion. Zionist "schlichim" (delegates) were always active in the camp, most of them messengers of the Jewish Agency. 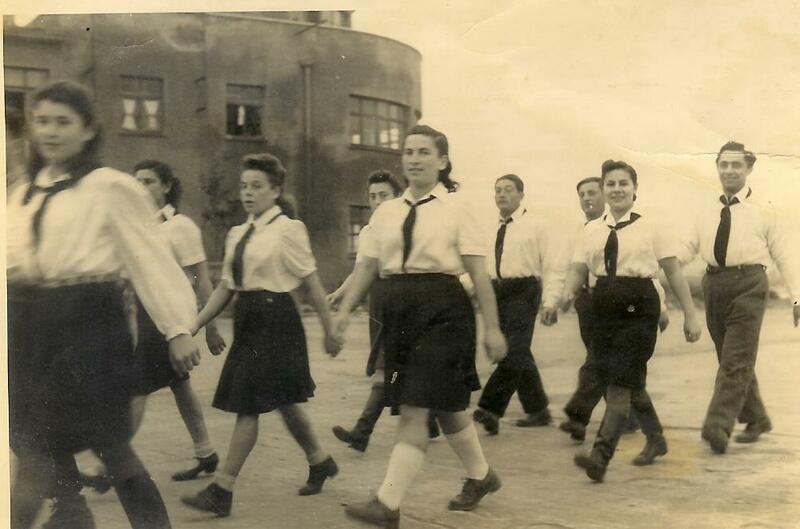 Well remembered was such a shaliach: Shika Bruk of blessed memory from Kibbutz Negba. 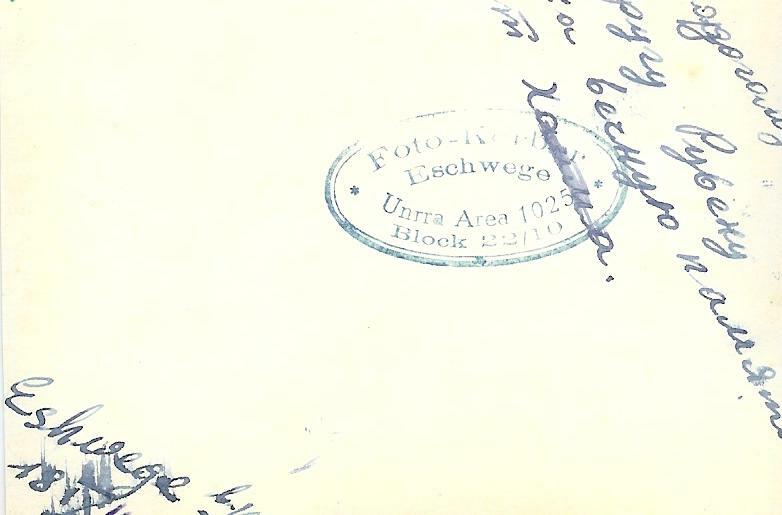 In the autumn of 1947, the group left Eschwege and Europe and started its journey towards a new life in Eretz Israel. UNRRA: The United Nations Relief and Rehabilitation Administration (UNRRA) was created at a 44-nation conference at the White House on November 9, 1943. Its mission was to provide economic assistance to European nations after World War II and to repatriate and assist the refugees (Displaced Person) who would come under Allied control. The U.S. government funded close to half of UNRRA's budget . 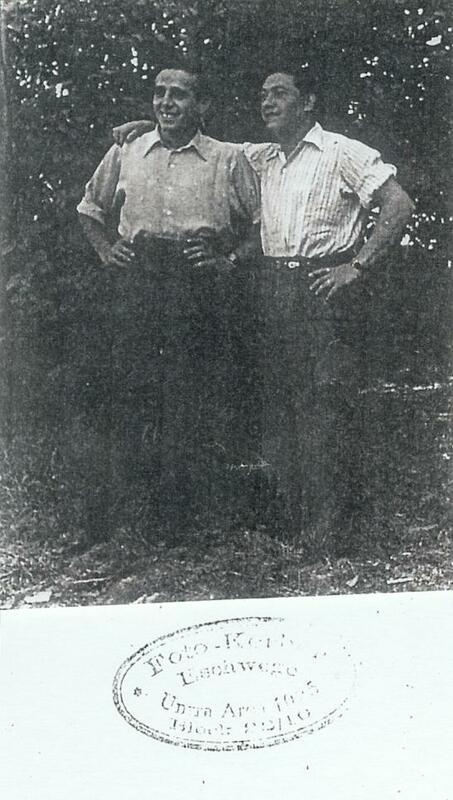 From right: Zeew Klasner and Zeew Wisenberg, a cousin who visited Eschwege. 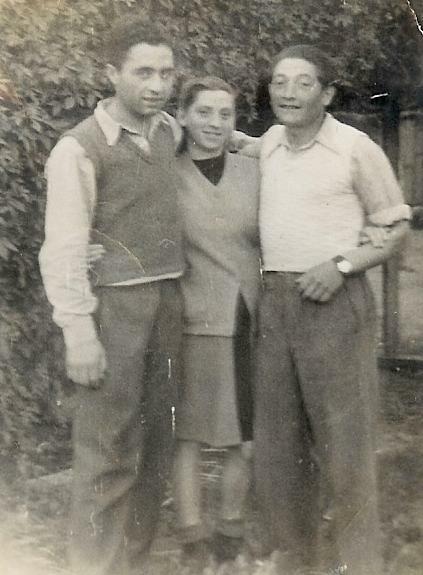 Standing from right to left: Yosef, Zeew Klasner, sitting: Woka Tiger and his wife Hala. 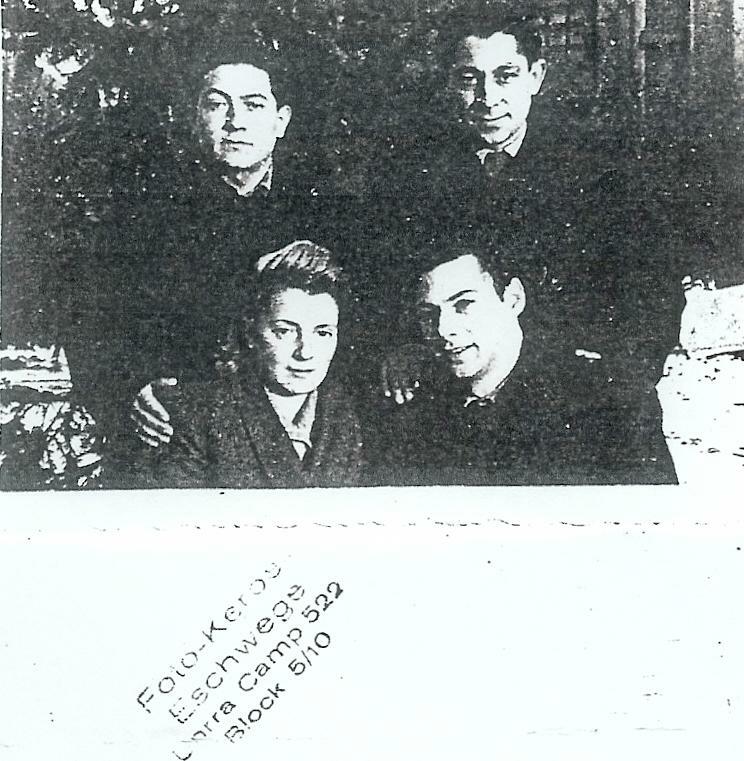 From rigght to left: Zeew (Woka) Tiger, Hala, Zeew Klasner anf Yosef. 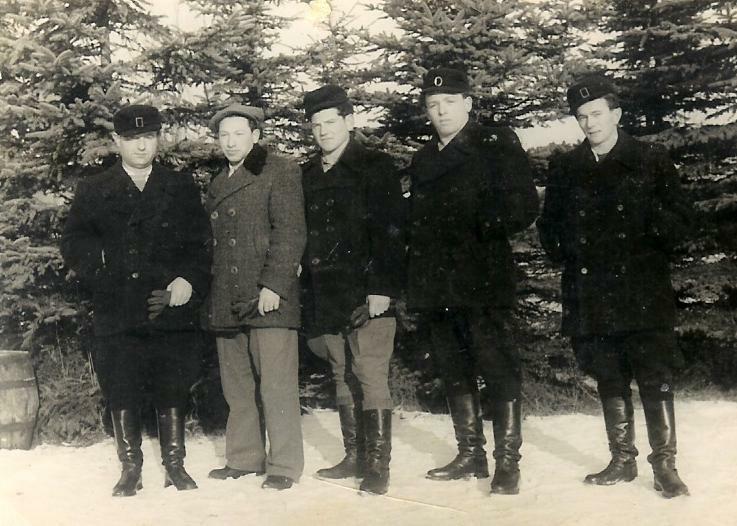 Standing from right to left: Zeew Klasner, Shoshana Fendel, Reuwen BarilowiczSecond row: Chaim Intrator, the guide Reuwen Monowicz and last is Szmuel Kriger. 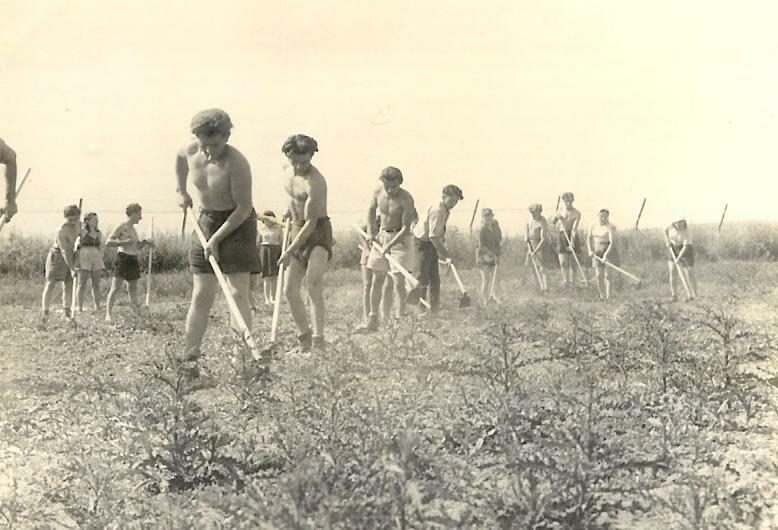 Eschwege DP camp: members of the Kibbutz working in the field, a destroyed airport. The first of the row is Arie Rozenfeld. Photographer: Kerber. 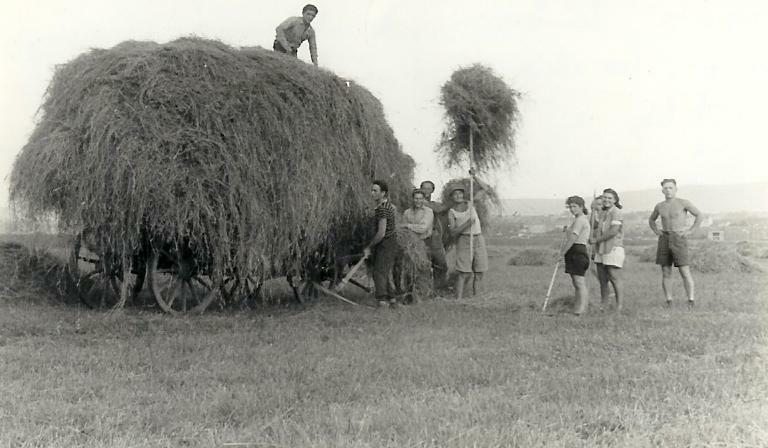 The youth pioneers from the Kibbutz of Hashomer Hatzair in the DP Eschwege. Standing to the right: Yona Brochanski, Dawid Ostrolenker, Halina Balin (Birenbaum), Binyamin Gorewicz, Miszka Fendel, Szoszana his wife, Sara Presler, Lea, Abraham Kac. From the album of Zeew Klasner, members of Hashomer Hatzair Kibbutz in a parade at Eschwege, DP camp, photographer: Kerber. 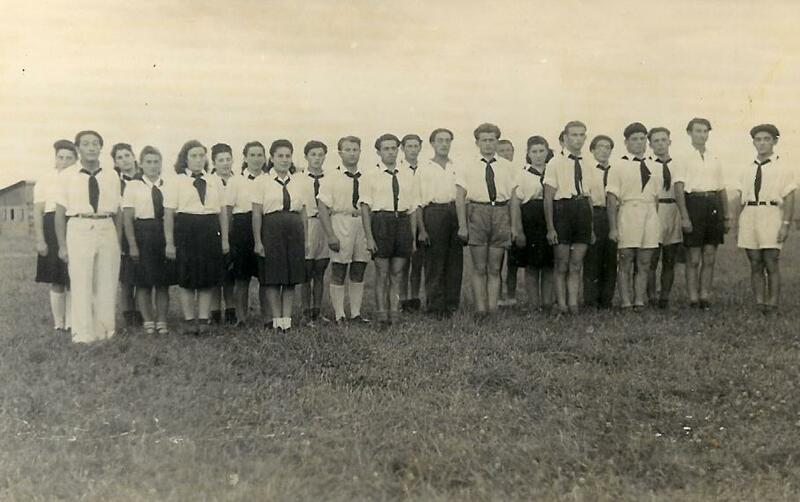 From right to left: Hercke Migdalowicz, Chaim Intrator, Fajga Kiferbaum, Zeew Klasner, Zlata Rozen, Szoszana Fendel, Marysia, Bronia. 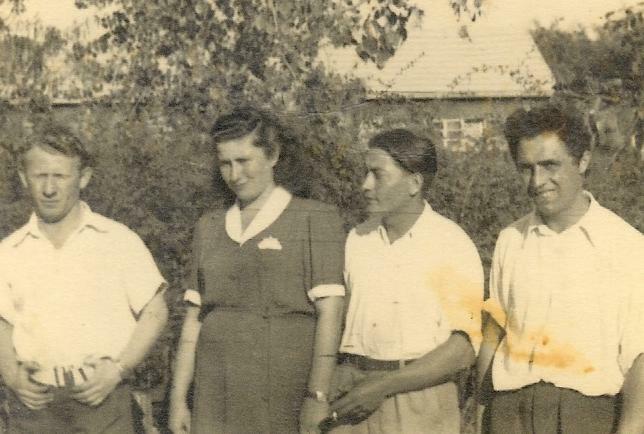 DP camp Eschwege: friends in the kibbutz of Hashomer Hatzair, standing from right to left: Leopold Lewkowicz, a friend from another kibbutz and Mendel Aharonowicz.. 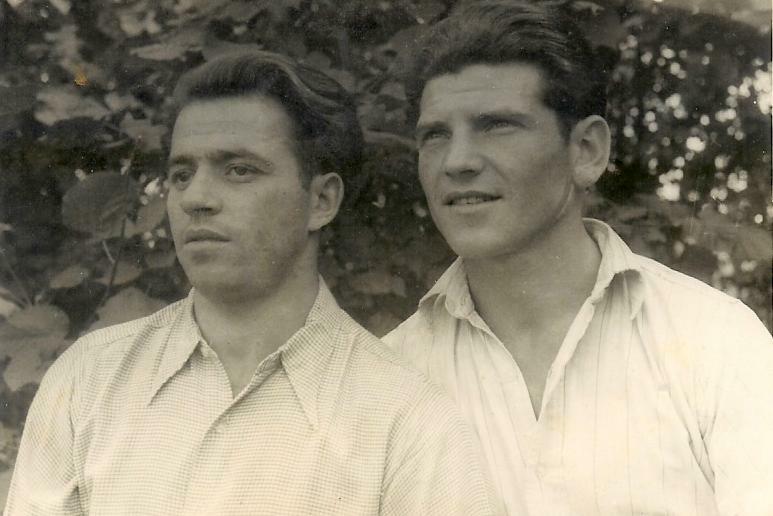 Sitting from the right: Icchak Rozen and Haim Birenbaum. Photographer: Kerber. 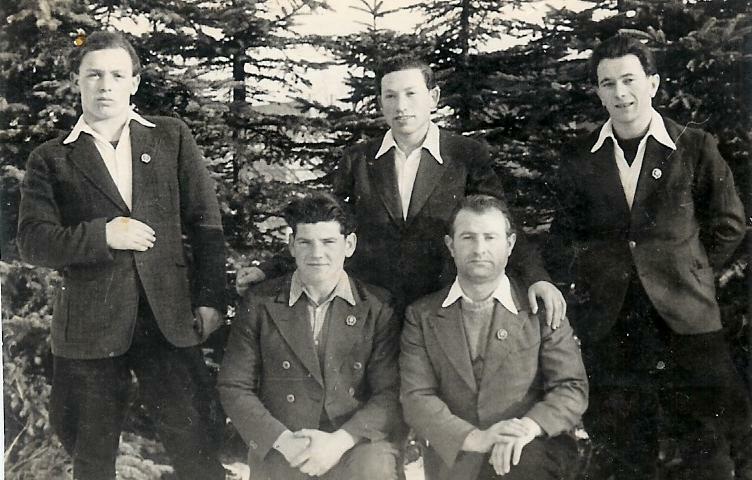 DP camp Eschwege: members of the Kibbutz: "Lachamei Hagetaot" - standing from right to left: Leopold Lewkowicz, Mendel Aharonowicz Haim Birenbaum, Eliezer and Flaksman, Icchak Rozen and Haim Birenbaum. Photographer: Kerber. 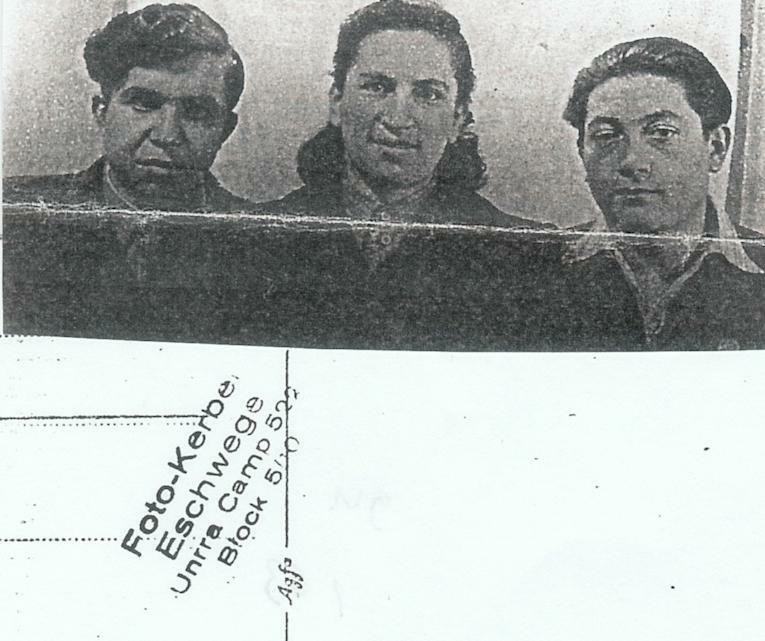 DP camp Eschwege, from right to left: Zeew Klasner, Hajka Mukaszewicz and Hercke Migdalowicz. Hercke admired Keber and spent a lot of time with him and his improvised "studio", because he also wanted to become a phoptographer. 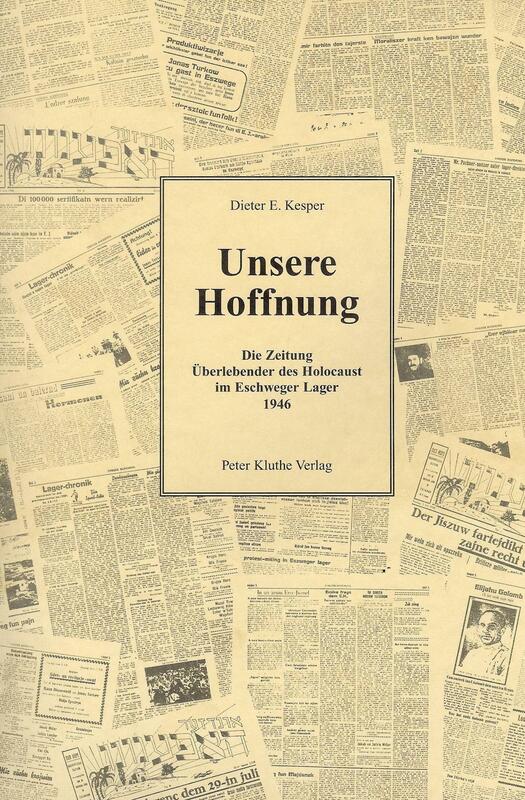 The book contains a collection of the newspapers published in D.P. 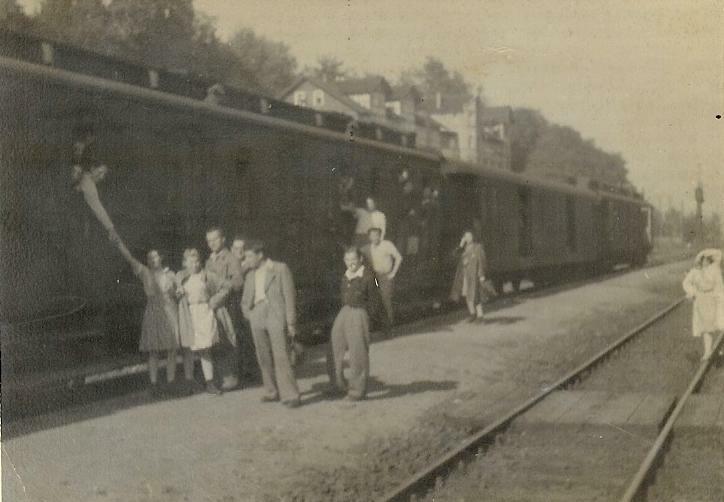 Eschwege Camp during 1946. It was written in Yiddish in Latin letters. 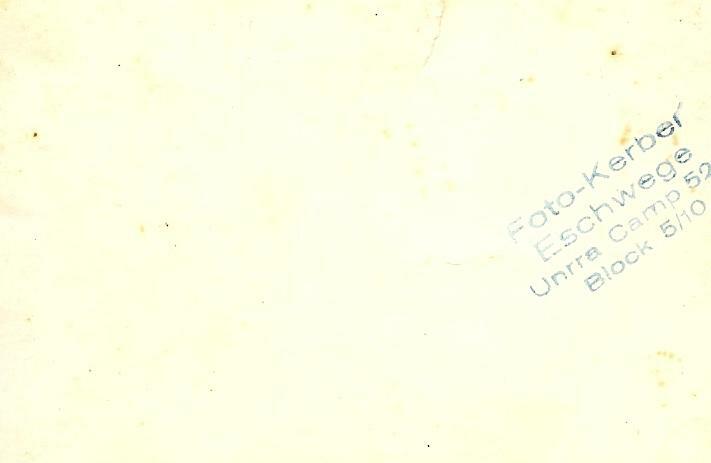 Many of the photographs in the newspaper were taken by the photographer "Umcza" Kerber ("foto Kerber"). The newspaper includes many articles and announcements indicating the rich cultural, Zionist, social and educational life revived in the DP Camp. On behalf of the UNRRA Administration I should like to express my pleasure that in Camp Eschwege we have been given the opportunity to publish our own weekly newspaper. Freedom of the press is one of the reasons for which we all fought this war. I hope that through the medium of our newspaper many people will relearn what this freedom means. it is important for your life in Palestine that everyone should understand clearly the meaning of freedom and democracy. i am sure that our newspaper will help to prepare you for your future happy future there. I therefore extend my very best wishes for the success of this new and most important undertaking.